Featuring @Nemamiah @shanodin @Sixtyten @echo @Swiftie @dapperatchik along with myself! It is literally the best format. I’m so excited to watch this progress. Smart ABT pick. That pretty gives you free reign over HB as who is going to try to draft HB without beta test? So will the next corp pick be mch or hostile infrastructure? On second thoughts, maybe you take temple before mch to stop an easy hate draft. 2 or 3 of those could reasonably swing toward Weyland if the NBN card pool gets too thin, though, right? And its the most fun I’ve had with netrunner in quite a while. Don’t even care if we play the decks. 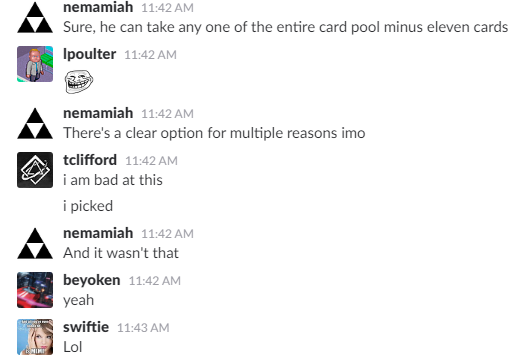 Haha, we also started doing this yesterday (without knowing you were also doing it) And its the most fun I’ve had with netrunner in quite a while. Don’t even care if we play the decks. I notice you reversed the draft orders for Corp and Runner. Was it more troublesome having to keep track of drafts, since the picks aren’t synchronised? Also, how did you all draft so quickly did y’all have a couple hours where everyone was online at the same time? Looking forward to see how your draft pans out. Like you, I don’t care about the games - the drafting in itself is so much fun! We have a great system which helps with both keeping track of who is picking and speeds up the draft. 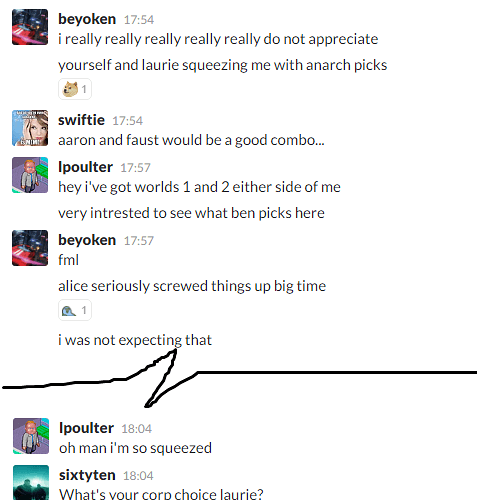 As soon as someone has made a pick everyone @ the next person on slack until they get fed up with notifications and make their choice. What’s the schedule for games? What’s the structure? We’re doing either 3 round Swiss or round robin. 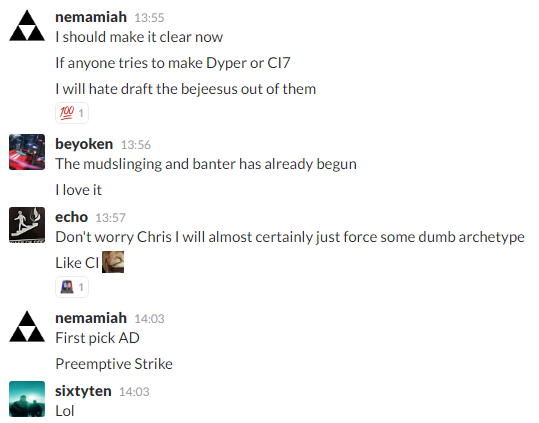 No ETA on when that’ll happen, since we don’t know when the draft will conclude! Chris wakes up to a nasty surprise.